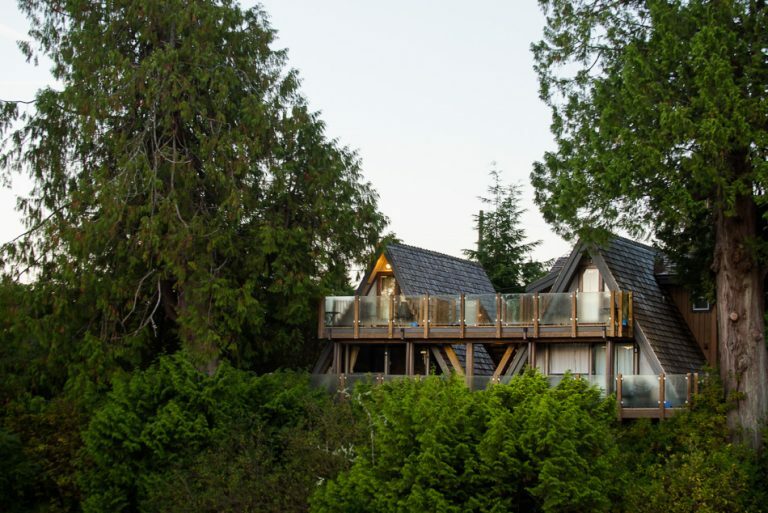 We are a boutique oceanfront resort in the heart of Tofino, nestled between old growth cedars, hanging on the edge of the shore. 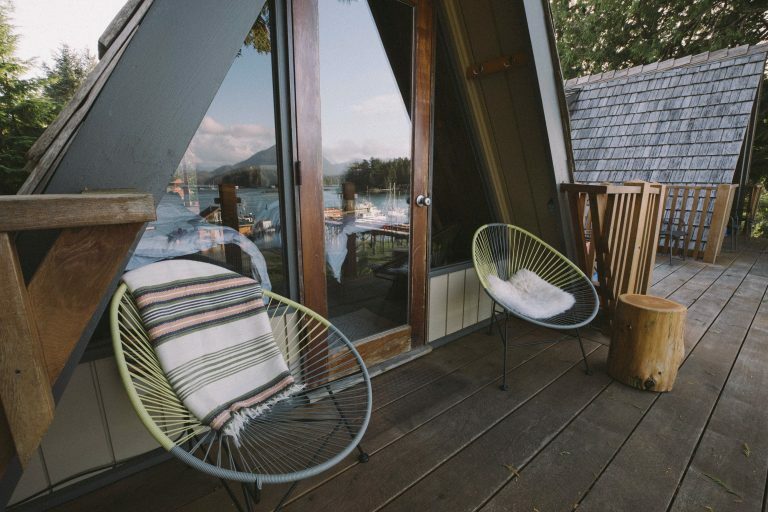 Originally built in the later 1960’s our property & its architecture are the definition of cabin vibes. 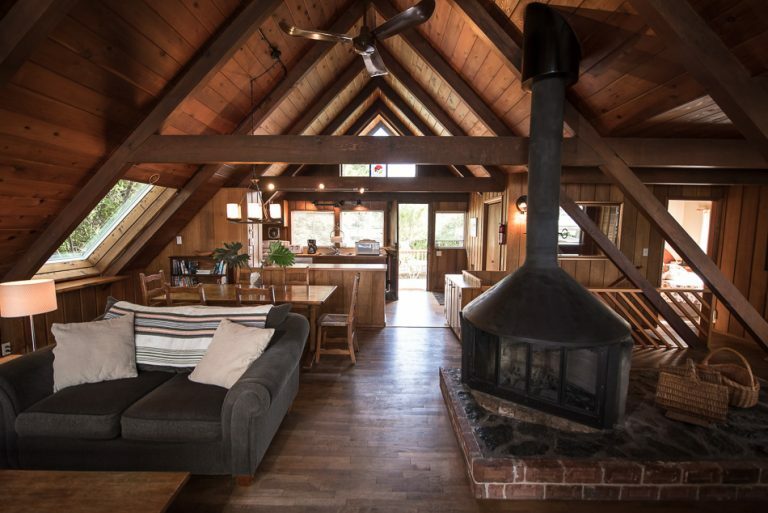 A rich natural landscape surrounds the property which consists of an A-frame house and two A-frame cabins. With our modern surf shack cool, the comforts of home, and thoughtful touches we offer an inspiring yet laid back feel. We are continuing our updates throughout the next year & would love to have you come join us on our journey. Visit our promotions page for great deals! 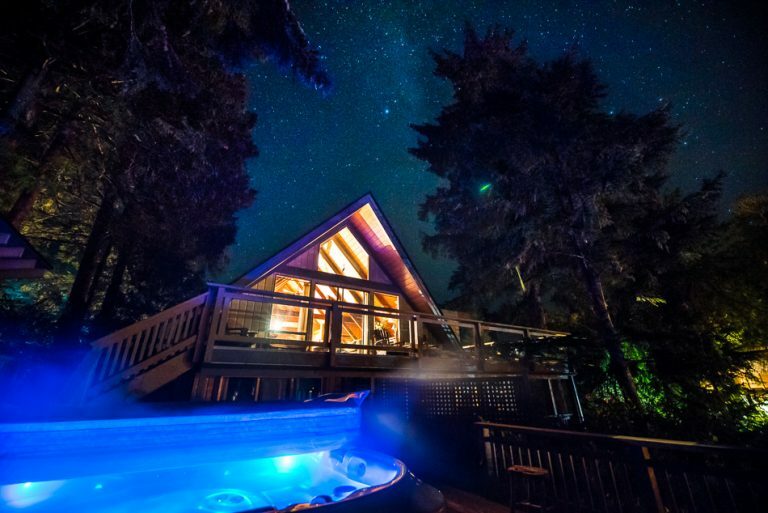 AFRAME HOUSE- beautiful custom built A-frame home offers incredible views of Tofino harbour. Two private decks with an ocean-view private hot tub and hot outdoor shower. Spacious living room with large windows and a retro wood burning fireplace.This house offers 2 queen bedrooms, loft with 2 twin beds, 2 bathrooms. Perfect for families, groups of 4-6. Low Season $329 per night. High Season $569 per night. CABIN SUITE 2 – The upper level of A-frame cabin 1. The honeymoon suite! This suite offers a private deck area, waterfront views, kitchenette, in-room soaker tub, full bath and a queen bed. Our most romantic suite, perfect for couples. Low season $199 per night. High season $349 per night. CABIN SUITE 3 – The upper level of A-frame cabin 2. The real deal, our coziest suite with full-on cabin vibes. 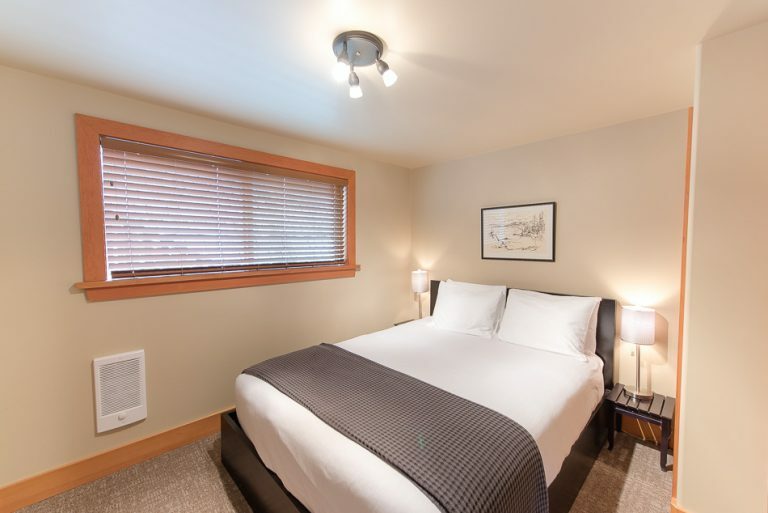 This suite offers a private deck area, waterfront views, kitchenette, bath and two twin beds. Perfect for groups of 2. Low season $129 per night. High Season $249 per night. CABIN Suite 4 – The lower level of A-frame cabin 2. 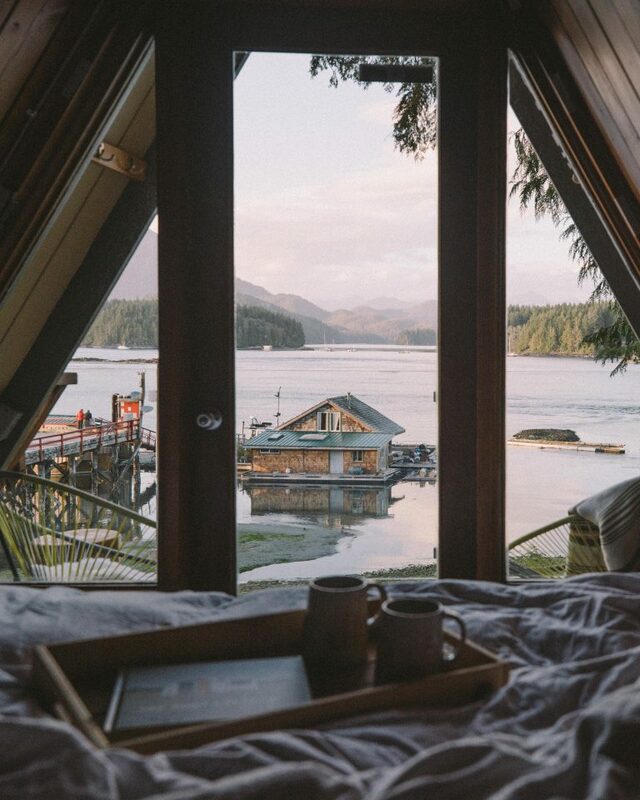 Boho meets west coast cabin. This suite offers a private deck area, waterfront views, full kitchen, full bath, queen bed, single bed nook, and a pull-out sofa. Perfect for groups of 2-4. Low season $189 per night. High season $329 per night. CABIN Suite 5 -The garden suite. This suite sits under the main home and includes a private deck area with BBQ, waterfront views, full size kitchen, spacious living room, full bath, queen bedroom and a pullout couch. Perfect for groups of 2-4. Low season $199 per night. High season $349. Take over the resort with up to 18 of your closest friends or family. A total of 5 suites plus the main house; including 6 queen beds, 3 single beds and 2 sofa beds. Full access to all amenities on the property. Group dinners in the main house, yoga on the decks, outdoor bbq’s in the common spaces, etc… all while giving everyone their own individual space in the private suites and rooms. Contact for quote.